The patterns that I used are from a Blackwork design called Black Beaumont, designer Elizabeth Almond, purchased from Nordic Needle website. It is a square design six by six blocks of Blackwork around the edges with a sort of formal garden looking Blackwork design in the center. 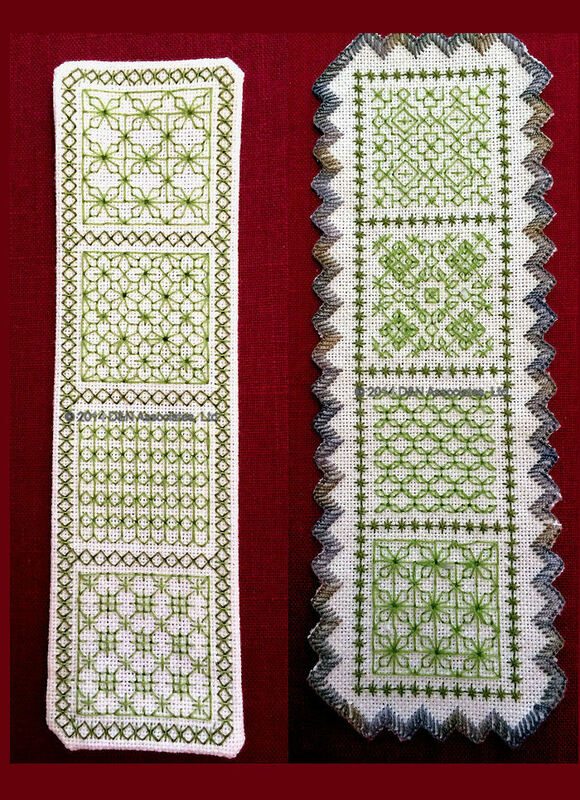 My plan had been to work these bookmarks as Blackwork, but I soon discarded that idea in favor of just enjoying working the patterns and not trying to plan out the route to produce identical back/fronts to the bookmark. I am using these bookmarks as trial pieces to determine which fabric, fabric count and which threads I want to use when I stitch the actual Black Beaumont design. The left bookmark: Ivory lugana fabric: 20 count, Zweigart, 52% cotton, 48% viscose. Worked in single strand. 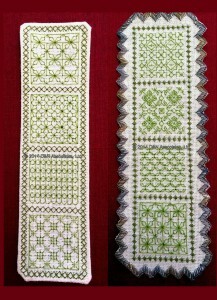 Threads are two green shades of DMC stranded cotton. The right bookmark: Ivory lugana fabric: 20 count, Zweigart, 52% cotton, 48% viscose. Pattern worked in single strand. Threads are two green shades of DMC stranded cotton. Edge is worked in a single strand of stranded cotton Rustic Brick (variegated blue-rust-green), Chameleon threads (number 66).